MOVIE REVIEW: Robin Hood – Too Long; Too Grim and Too Much! I can’t even begin to chart the historical inaccuracies of Robin Hood [which are the only things that Ridley Scott’s bloated origin story has in common with those Robins who have gone before] which makes all of the film’s efforts to evoke a real time and place kind of pointless. So Robin Hood is working from a negative sum to start. There are some references to the Robin Hood legend, though they aren’t exactly as seen before [Robin’s fight with Little John, for example, does not take place with quarterstaffs] and seem like afterthoughts. The story is that of a yeoman [commoner] named Robin Longstride [Russell Crow], an archer in Richard the Lion Heart’s crusading army, who returns to England bearing the news of Richard’s death [disguised as a knight] and then returns Robert of Loxley’s [Douglas Hodge] sword to his father, the aged, blind Sir Walter [Max von Sydow]. Loxley takes him in and asks that he pretend to be the returned Sir Robert – and husband of Lady Marian Loxley [Cate Blanchett]. Meanwhile, an English nobleman named Godfrey [Mark Strong] is enlisted by the French king to turn the English against their king – John [Oscar Isaac], a spoiled party boy who has been cavorting with Isabella [Lea Seydoux], a French noblewoman who becomes the excuse for the French to invade England. Robin Hood is actually even more convoluted than that, but what’s the point of any further description when the film is such a blatant collection of clichés [see Robin scream ‘Nooooooooooo’ in a slow motion sequence; see arrows fly through Matrix-inspired bullet time-like sequences] that all that’s missing is for Robin to paint half his face blue. 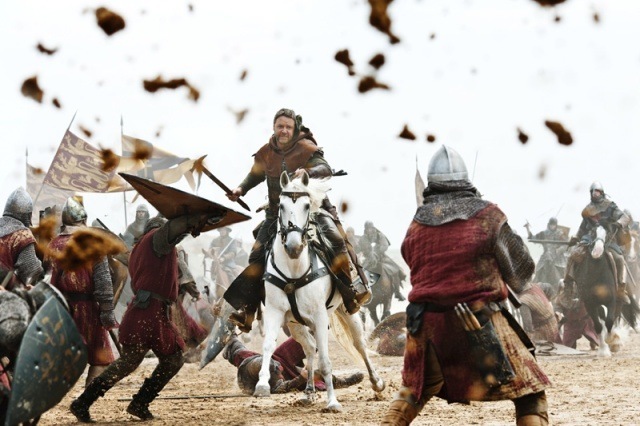 Sure there are well-staged action sequences, and the battle scenes [not quite the same things] are well choreographed. And yes, there are some extremely good performances [enjoy Kevin Durand’s Little John – a rare good guy character for him, and Mark Addy’s Friar Tuck, source of the film’s only real humor]. In the final battle, Robin’s weapon of choice isn’t even a bow – it’s a hammer! Unfortunately, there are so many moments that just don’t work, and Robin Hood is just so ponderous – that the two-and-a-half hour would-be epic just doesn’t cut it. “Robin Hood” is a prequel with plenty of violence, romance, and foreground music. The finale is Normandy beach of WW2 except on the opposite shore. Not for the squeamish.